Berlin, August 21, 2013 - John Deere’s new 7R Series tractors for 2014 feature more powerful engines and a new top of the range model. The new line-up will consist of six models delivering 210, 230, 250, 270, 290 and 310hp at rated engine speed. The flagship 7310R will be available in limited numbers from spring 2014 and will feature a new Stage IV compliant engine, while all the other 7R Series tractors will be powered by John Deere’s proven diesel-only technology. New technology allows the 7230R’s former 9-litre engine to be replaced by a 6.8-litre unit, while still maintaining the same high maximum torque, torque rise and power bulge as before. The change to a smaller engine also increases the power density and reduces this tractor’s operating costs. While the 7250R, 7270R and 7290R continue with the 9-litre engine with dual turbocharger, the new 7310R will feature Stage IV compliant engine technology. For transport and PTO applications, the engines’ intelligent power management (IPM) system provides an extra 22hp on the 7290R and an extra 30hp on all other models. The range is expected to deliver two per cent better fuel efficiency overall. Even with the addition of SCR, John Deere aims to reduce total fluid consumption to even lower levels than at present. However, the company will continue to offer improved Stage III B compliant diesel-only engines on both 7R and 8R Series tractors. A new and more efficient cooling package on these engines reduces airflow resistance to provide higher cooling capacity. The individual components of the system have been completely rearranged, and the fan has been redesigned to pull air through the engine rather than push it. The latest 7R Series tractors will be available with a newly designed e23 transmission offering 23 forward and 11 reverse speeds, and equipped with Efficiency Manager. This feature allows the operator to preset the working speed, and helps to save fuel by keeping the engine rpm at an optimum speed by automatically shifting up and throttling back. This new fully automatic transmission offers 23 equally spaced power shiftable gears. With every shift of the transmission, the operator can smoothly increase the speed of the tractor by 15 per cent even when under full load. To precisely match operating conditions and implement needs, the e23 transmission has 14 gears between 2.5 and 16km/h (1.6 and 10mph). Depending on the task, the transmission can be operated in three different driving modes, and an optional left-hand reverser is also available. The new 7R Series tractors offer a CommandQuad transmission on the 7210R and 7230R models, or the option of e23 or AutoPowr transmissions across the whole model range. AutoPowr’s ‘pedal mode’ enables the operator to change the ground speed while operating PTO driven equipment that demands constant engine rpm. A new CommandArm console is standard on all 7R Series tractors and replaces the right-hand console of previous models. Featuring a more intuitive and ergonomic layout, the CommandArm console groups the tractor controls by function and integrates completely with the new CommandCentre, which features a new interface and is available with either a 17.8 or 25.4cm (7 or 10in) touchscreen display. The new CommandView III Cab has a 40 degree swivel seat with back rest extension, and customers may choose between a standard air spring seat, the field-proven ActiveSeat or hydraulic cab suspension (HCS) for extra driving comfort. The cab also features laminated glass for safety and a quiet operating environment, and a refrigerator for storing food and drinks. Integrated systems enable the use of John Deere’s FarmSight precision farming technology, and a hydraulic joystick with gear shift is available for the CommandQuad and e23 transmissions. Other options include a 360 degree LED lighting package and full coverage front and rear fenders. 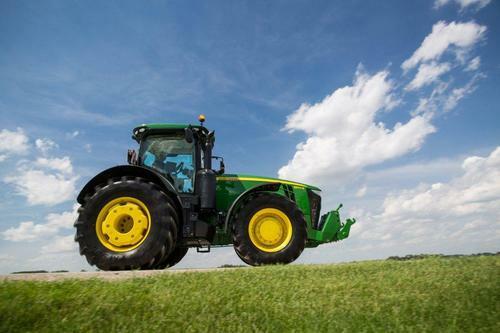 John Deere’s 8R and 8RT Series wheeled and tracked tractors, featuring Stage III B compliant diesel-only engines, are also being updated for 2014, with increased horsepower on all models. The new 8R line-up will consist of five tractors delivering 270, 295, 320, 345 and 370hp at rated engine speed, while the 8RT tracked versions will be rated at 320, 345 and 370hp. Several of the new 7R Series tractor features will also be introduced on the 8R Series, including the e23 transmission with Efficiency Manager, which will be available for 2015. AutoPowr will still be offered on all 8R and 8RT models, and the established 16-speed Powershift transmission is available on the 8270R, 8295R and 8320R. The updated 8R Series will also feature the same seat options, integrated hydraulic joystick and CommandArm console with CommandCentre display. Other significant improvements have been made to the 8R Series to help maximise the tractors’ efficiency and productivity. These include widened hitch rails to simplify the connection of PTO-driven implements and keep the PTO shaft from contacting the rails, plus an additional 1000/1000E speed PTO option, which increases the efficiency of PTO driven applications using reduced engine RPM. A new bolt-on PTO shaft is also easier to use and exchange, and a new hydraulic top link makes it easier and quicker to connect implements and adjust them from the cab during work. For those requiring increased hydraulic capacity, an optional dual high-flow pump delivering 321 litres/min is available as an alternative to the standard 227-litre/min pump, and there is a 90-litre take-out capacity for quicker operation with larger trailers or loader wagons. The hydraulic system provides improved steering capacity on both mechanical and independent link suspension (ILS) front axles, and up to six independent rear SCVs and two independent front SCVs can be specified. Further improvements have been made to apply the 8R’s greater power to the ground. Optional large Group 49 tyres (215cm in diameter with a section width up to 900mm) provide an even bigger footprint, higher power transfer and reduced soil compaction. New full-coverage rear fenders, 710mm front fenders and flanged axles are also available.